Food | The Essence of Ni-Vanuatu Life. 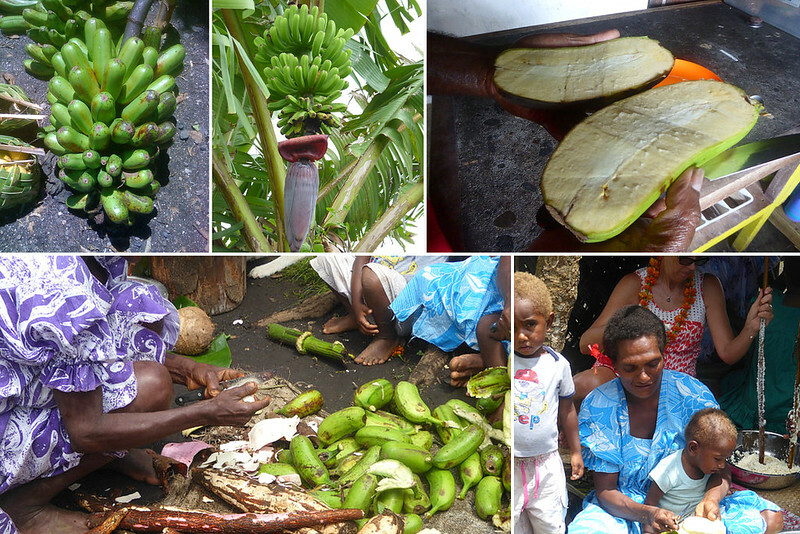 Food Culture in Vanuatu | A Truly Authentic Experience. Food provides the best experiences for travellers to comprehend the “otherness” of another culture, and quickly illustrates the distinctiveness that differing cultures embody. Food, meals, toiling in the fields and rearing animals often only gets a cursory glance by tourists who mainly want the quickest route from attraction to attraction, but sometimes the greatest insights can be obtained by just sitting and observing everything around oneself at mealtimes. Travellers are more content to absorb what is presented to them and obtain a more global or substantive picture of the communities they are visiting. 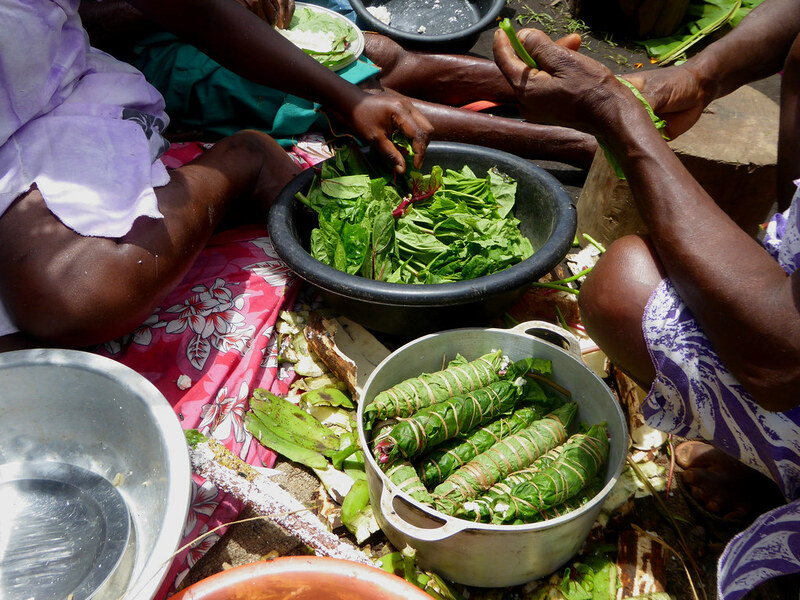 Food provides a direct connection to obtaining authentic images and “slices of life” of Melanesian customs that have not changed since the time of Captain Cook and adds to the understanding that travellers gain from their time in the islands. 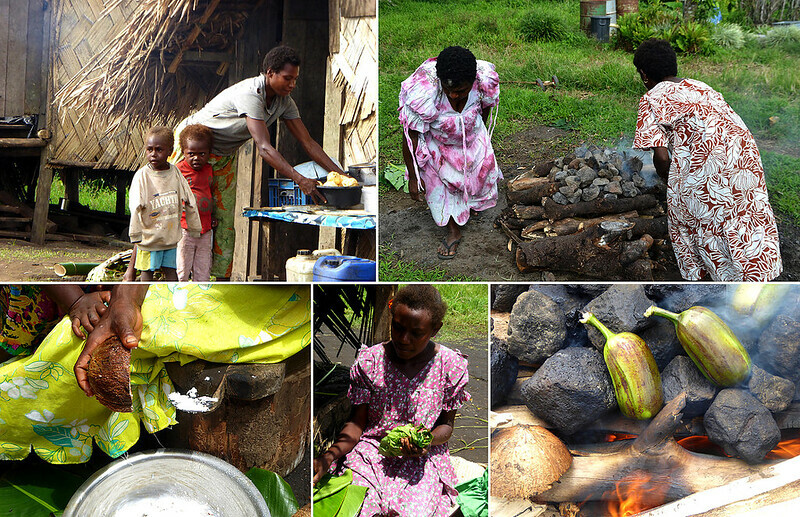 Food production, preparation, and cooking provide a central part of community life, and much of the “kastom” rites and ceremonies exist in Melanesian society are focused on these functions. The Traditional Food | Yams, Taro and Banana. 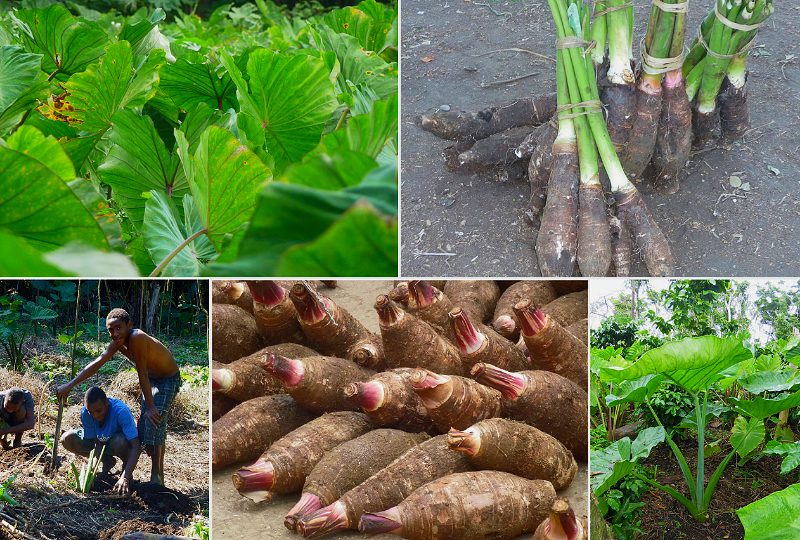 The traditional stables of yam and taro have provided the basis for Tannese diets since settlement of the island, supplemented by similar starchy foods such as kumala, banana (cooking varieties), and manioc. However over time rice has increasingly gained acceptance amongst local peoples as it is relatively easy to store, easy to cook and absorbs the same traditional flavourings that customary stables impart. It is mainly imported, but also grown in limited quantities. The use of greens, in the form of bush cabbage (many varieties) generally complements the stables, and is used extensively in the preparation of specific Tannese meals. The incorporation of alternative vegetables is minimal and used almost as a secondary flavour to a dish rather than as a featured taste. However, coconut milk provides much of the meal flavour, and serves the dual function of providing a cooking medium as well as imparting taste to otherwise bland food. The Village Garden | The Centre of the Universe. Tannese life surrounds working in the village garden. Two meals are the norm, morning and evening, with the later being the more elaborate due to the time that is available to prepare it. The morning meal may consist of the leftover of last nights dinner, although this is unlikely. People are accustomed to modifying their intake to what is available, and while normal portion sizes are cooked, if there is a shortage then the meals will be accordingly much smaller, or alternatively, if a large fish is caught then it will be cooked and eaten in one sitting no matter what the size. Lap-lap is the mainstay of the evening meal, with Tanna soup also popular, each of which takes some preparation. The morning meal is similar to the evening meal, but much simpler and may consist of boiled taro , banana or anything that is around that can be cooked or eaten. Quick Lap-Lap is grated or scraped banana that is pulped and fried in oil, it is quick, light, delicious and can be accompanied by meat, taro, rice or vegetables. That is not to say that nothing is eaten during the day, and working in the garden has its benefits. Gardens are typically semi –organized plots centred around the plantings of the main stables, intermingled with banana, fruit such as pawpaw, pineapple, sugarcane and many varieties of nuts . Spices such as ginger, turmeric, galangal, and chili are spotted here and there, while cabbage and bok choy find a greater priority. Carrots, beans, and other vegetables have less of a priority and will require some searching to find. Workers will graze on the garden food when breaks are taken or as appetite demands, and may simply consist of cutting up a ripe pawpaw and distributing it, or collecting some large nuts that are cooked over a small fire. Village Cuisine is Simple, Organic and Provides a Community Focus. Due to the way of life, village cuisine is not elaborate and meals do not typically consist of collecting a multitude of ingredients for meal preparation. 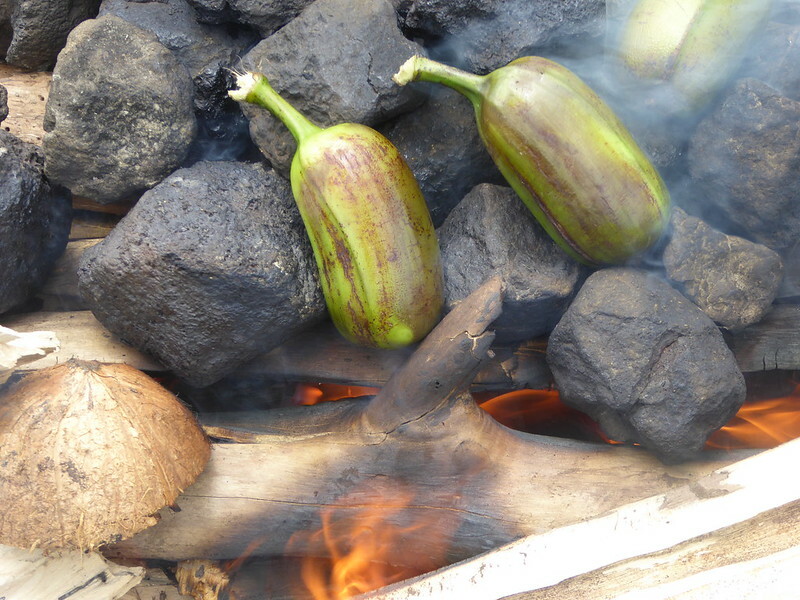 It is not uncommon for a single item such as cooking banana to be cooked singularly, and eaten and later separately a fish cooked or chicken prepared. Food preparation and cooking fulfills two needs of the human condition, firstly that of providing sustenance, and secondly setting an environment within a group of people to socialize and interact. The seemingly basic food preparation of Melanesian communities leans heavily toward the purely functional purpose, but that does not mean that delicate and distinct culinary preparation is always absent. Elaborate food preparation is generally associated with societies that have created ample available free time, and where socialization on a daily basis has subsequently evolved around meals. 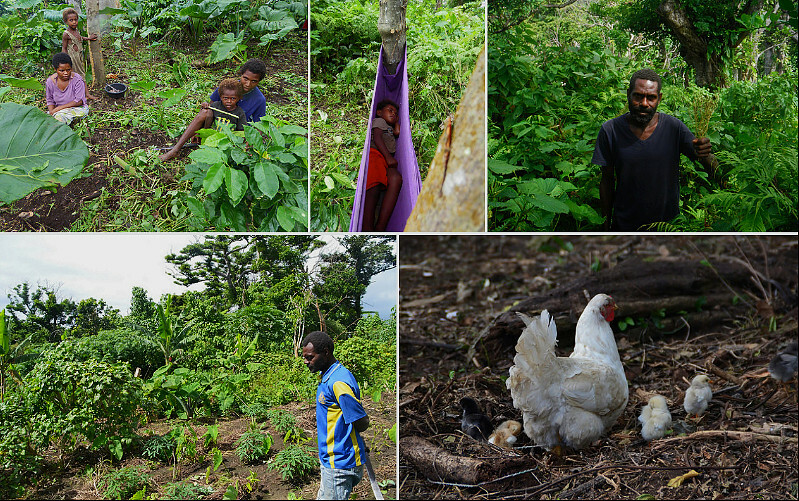 For Melanesian communities, time tending essential subsistence production has not allowed this to flourish, but that is not to say that the foundations of a rich culinary style, is not in existence. The ‘Around the Island’ Trip – Efate Island, Vanuatu. Pacific Mega Cyclones : Experiencing a Category 5 Cyclone.